It is full steam ahead to the Bagot Handicap for De Little Engine. The Danny O’Brien-trained young stayer made it three successive wins when he continued his impressive journey through the grades to win the Bitalli Handicap (2540m) at Flemington yesterday. The son of Encosta De Lago out of Victorian Oaks winner Arapaho Miss has won a BM70 at Ballarat’s stand-alone meeting over 2300m, a BM78 at Sandown over 2400m and now a BM84 at Flemington. “There is a little in the tank and if he continues the way he is going the Bagot is within his scope,” O’Brien said. The Listed Bagot Handicap (2800m) is run at Flemington on New Year’s Day. O’Brien knows what is needed to win the race, having saluted with Gallopin in 2008. “His test will be now in the Bagot but he has gone through his grades and distances without any dramas so I see no reason why he won’t shape up for the Bagot,” O’Brien said. De Little Engine, who was so named because he was so small when he first entered the O’Brien yard, certainly has a big motor. The four-year-old ($2.90 favourite) settled behind the leaders but when jockey James Winks found the opening he stretched out and defied the Peter Moody-trained Rodway ($6.50) by a half-length, with Great Lane ($12) and Martinvast ($12) dead-heating for third. The gauge of the gelding’s improvement can be judged by the efforts of Rodway, out of the mare Tugela who produced the great Makybe Diva. He gave that gelding 5.5kg in weight — 1kg more than their previous meeting — and still beat him home. Winks said his only concern was getting a gap when the field straightened. 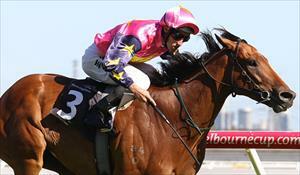 “He knows he has had a run with the track on the firm side and a hot day. But he is going great,” he said.